Dinosaur and prehistoric animal themed articles, features and stories. The first fossil evidence of a lambeosaurine duck-billed dinosaur has been reported from the Liscomb Bonebed (Prince Creek Formation) of Alaska. Part of the top of a skull, a bone called the supraoccipital (it forms part of the braincase), has been found during field work on the famous Alaskan fossil site on the banks of the Colville River. This discovery demonstrates that both lambeosaurine and hadrosaurine dinosaurs lived in the high Arctic during the Late Cretaceous. It also suggests that the crested lambeosaurines may have preferred inland environments, whilst their cousins, the hadrosaurines dominated the ecosystem in coastal and low-lying, near shore environments. Hadrosaurines and lambeosaurines co-existed in low-lying, coastal areas of the Late Cretaceous of Alaska. Writing in the on-line, academic journal “Scientific Reports”, researchers from Hokkaido University (Japan) and the Perot Museum of Nature and Science (Dallas, Texas), confirm the discovery of a skull bone associated with a lambeosaurine (crested duck-billed dinosaur) in the hadrosaurine dominated Liscomb Bonebed, a site that has to date, yielded some 6,000 dinosaur bones. The fossils exposed on the banks of the Colville River in a region of Alaska known as the North Slope, represent one of the most important Maastrichtian-aged dinosaur fossil sites in the world. It has provided evidence of a high latitude Late Cretaceous dinosaur dominated ecosystem. The bonebed is described as a monodominant, multitaxic unit as although 98.5% of all the fossils found represent just one species – the hadrosaurine Edmontosaurus* other types of dinosaur including three Theropods have been identified from fossils found at this site too. The supraoccipital confirms the presence of lambeosaurines at this location as well, although, based on the ratio of hadrosaurine to lambeosaurine fossils found, crested duck-billed dinosaurs probably only made up a tiny portion of the entire plant-eating dinosaur community. Lambeosaurine supraoccipital (DMNH 2014-12-266) from the Liscomb Bonebed (a) dorsal view, (b) ventral view, (c) left lateral view, (d) posterior view, (e) anterior view and (f) right lateral view. Note scale bar = 2 cm. The dorsal (a) and posterior views (d) show the two, prominent bumps (squamosal bosses) that helps to identify this bone as lambeosaurine material. Abbreviation sqb = squamosal bosses. The newly described supraoccipital differs from those of hadrosaurines as it has large, prominent bumps towards the back of the bone (squamosal bosses). It is also a different shape when compared to supraoccipital bones associated with members of the Hadrosaurinae such as Edmontosaurus. For example, it is proportionally shorter in length (when measured from the front to the back of the bone – anterior to posterior). The dinosaur family known as the Hadrosauridae is split into two main, but closely related lineages, the Lambeosaurinae and the Hadrosaurinae. Traditionally, these two groups have been distinguished by their skulls, lambeosaurines having hollow crested skull crests, whilst the hadrosaurines lack bony crests. This assessment might prove too simplistic, but for the time being, the general classification of Hadrosaurs into these two sister lineages remains the consensus. Tracing the Evolution of Duck-billed Dinosaurs. Two distinct but sister lineages are recognised the non-crested Hadrosaurinae and the hollow crested Lambeosaurinae. Field team members excavating the Liscomb Bonebed. The single fossil bone might not be sufficient to erect a new genus of lambeosaurine dinosaur, but the discovery is extremely significant as it links the dinosaur biota of the most northerly portions of North America to dinosaur faunas from the Late Cretaceous of northern Asia. For example, Nipponosaurus (N. sachalinensis) from the North Pacific island of Sakhalin, is also a lambeosaurine. Palaeogeographical records of lambeosaurines during the Late Cretaceous. The red star represents the Liscomb lambeosaurine fossil find. The Liscomb Bonebed might be dominated by fossil material assigned to the Hadrosaurinae, but the discovery of a single fossil bone indicates the presence of lambeosaurines. This site is representative of a coastal, near-shore environment and it differs from the lambeosaurine dominant structures of localities in Russia and China interpreted as inland environments. The researchers postulate that crested duck-billed dinosaurs (lambeosaurines), preferred inland habitats, whilst the non-crested duck-bills (hadrosaurines), favoured coastal habitats. Different habitat preferences might have been a strategy to avoid excessive competition between these two groups of closely related dinosaurs. Hadrosaurines (grey) may have preferred lowland coastal habitats whilst the lambeosaurines (black) may have dominated faunal ecosystems further inland. Things are never that straight forward in vertebrate palaeontology. In 2015, a new taxon of hadrosaurine was erected based on the Liscomb duck-billed dinosaur bones. The new species was named Ugrunaaluk kuukpikensis and although it was believed to be closely related to Edmontosaurus, it was established as a separate taxon. However, in 2017 subsequent analysis challenged this conclusion. Ugrunaaluk had been erected based on the study of fossil bones from immature individuals of various growth stages. The hadrosaurine bones from the Liscomb Bonebed overwhelmingly represent the remains of juveniles. The establishment of a unique duck-billed dinosaur taxon for northern Alaska remains controversial. Many palaeontologists now consider Ugrunaaluk to be nomen dubium (not a valid genus). The scientific paper: “The First Definite Lambeosaurine Bone From the Liscomb Bonebed of the Upper Cretaceous Prince Creek Formation, Alaska, United States” by Ryuji Takasaki, Anthony R. Fiorillo, Yoshitsugu Kobayashi, Ronald S. Tykoski and Paul J. McCarthy published in Scientific Reports. A paper published in the PNAS (Proceedings of the National Academy of Sciences – USA), provides a detailed snapshot of a terrible natural disaster linked to the Chicxulub bolide impact event. A site (Tanis), in North Dakota’s Upper Cretaceous Hell Creek Formation, records the devastation caused by a massive surge of water which occurred as seismic shockwaves reverberated around the Earth as a result of the huge extra-terrestrial impact in what is now the Gulf of Mexico. Identifying the K-T boundary at the margins of Upper Cretaceous sediments. A team of palaeontologists, including researchers from the University of Kansas, the Black Hills Institute and Manchester University, in collaboration with a number of other academic institutions report on what has been described as a “motherlode of exquisitely-preserved plant, animal and fish fossils”, the remains of a river ecosystem which flowed into the Western Interior Seaway, which was wrecked within minutes of the extra-terrestrial impact event. The site is described as a “rapidly emplaced high-energy onshore surge deposit” along the KT boundary that contains associated ejecta and iridium impactite associated with the End Cretaceous extinction event that resulted in the loss of many groups of terrestrial vertebrates including the pterosaurs and the dinosaurs as well as the extinction of a wide variety of marine organisms. “A tangle mass of freshwater fish, terrestrial vertebrates, trees, branches, logs, marine ammonites and other marine creatures was all packed into this layer by the inland-directed surge”. The Tanis Konservat-Lagerstätte. Plaster field jacket (A) with partially prepared (freshwater) Acipenseriform fish next to a fragment from an ammonite shell (inset). The researchers conclude that the fossil site does not record a tsunami. Tanis is more than 2,000 miles from the bolide impact site in the Gulf of Mexico, a tsunami would have taken at least seventeen hours to reach North Dakota, but seismic waves and a subsequent water surge would have occurred within minutes of the collision. A seiche (pronounced “saysh”), relates to a standing wave in an enclosed or part-enclosed body of water. This term was first used widely by the Swiss scientist François-Alphonse Forel (1841-1912), who pioneered the study of inland water ecosystems. It is believed the etymology derives from the Swiss/French dialect meaning “swaying back and forth”, a reference to observations of water level changes in alpine lakes. This phenomenon can have many causes, but seismic activity is known to lead to water surges. According to Kansas University researchers, even before the surge arrived, Acipenseriform fish (sturgeon) found at the site already had inhaled tiny spherules ejected from the Chicxulub impact. Fish Fossils show evidence of microtektites embedded in their gills. The picture above shows Acipenseriform fish with ejecta clustered in the gill region. Image (A) an X-ray of a fossil sturgeon head (outlined, pointing left; FAU.DGS.ND.161.115.T). Magnified image (B) of the X-ray in (A) showing numerous ejecta spherules clustered within the gill region (arrows). Images C and D are micro-CT images of another fish specimen (paddlefish), with microtektites embedded between the gill rakers in the same fashion. One of the co-authors of the paper is Californian geologist Walter Alvarez, who, along with is his father Luis, postulated the theory of an impact event playing a role in the End Cretaceous extinction (1980). They identified a layer of sediment in the strata marking the Cretaceous/Palaeogene boundary (KPg), that was enriched with the rare Earth element iridium and they concluded that an extra-terrestrial object must have collided with the Earth. An extra-terrestrial impact event. Moments before the impact event, now scientists have fossil evidence providing data on what happened minutes after the collision. The number and quality of preservation of the fossils at Tanis are such that Burnham dubs it the “lagerstätte” of the KT event. A lagerstätte, comes from the German “storage place”, it describes a sedimentary deposit that contains a large number of very well preserved fossils. For example, the Tanis site preserves numerous Acipenseriform fish, which are cartilaginous and not bony and therefore less likely to become fossils. Indeed, the Tanis location contains many hundreds of articulated ancient fossil fish killed by the Chicxulub impact’s consequences and is remarkable for the biodiversity it reveals alone. A site map (left) showing the flow of water indicated by the orientation of the material and a mass deposit of fish from the site. The scientists conclude that there are likely to be several new species of fish named as a result of this discovery. In addition, some specimens are the best known examples of their genus found to date. It was quickly realised that the surrounding matrix was deposited by a sudden, violent rush of water, a surge that was directed inland away from the Western Interior Seaway. Impact debris including shocked minerals and ejecta spherules were found in the sediment and a compact layer of KT boundary clay overlies the deposit. Tanis provides a post impact “snapshot,” including ejecta accretion and faunal mass death, advancing our understanding of the immediate effects of the Chicxulub impact. According to Burnham, this site will advance our understanding of the Chicxulub impact significantly, describing Tanis as “smoking-gun evidence” of the aftermath. Everything Dinosaur acknowledges the assistance of a press release from the University of Kansas in the compilation of this article. The scientific paper: “A Seismically Induced Onshore Surge Deposit at the KPg Boundary, North Dakota” by Robert A. DePalma, Jan Smit, David A. Burnham, Klaudia Kuiper, Phillip L. Manning, Anton Oleinik, Peter Larson, Florentin J. Maurrasse, Johan Vellekoop, Mark A. Richards, Loren Gurche, and Walter Alvarez published in the PNAS. The latest Everything Dinosaur newsletter was published this week and it featured the new PNSO Age of Dinosaurs models as well as a couple of old favourites. Just in at the warehouse, the giant “Nick” the Ceratosaurus figure, “Brook” the Ophthalmosaurus along with a 1:35 scale Mamenchisaurus and all twenty-four of the new for 2019 PNSO Toys that Accompany your Growth model series. The huge PNSO Ceratosaurus model – “Nick”. This is a huge model, the box alone measures more than half a metre in length. The model inside is enormous and it deserves top billing in our spring newsletter. The figure is beautifully painted and depicts this Late Jurassic Theropod in an aggressive pose with one foot raised off the ground. The model is supplied with two supports to help it to be displayed. It towers over other Theropod dinosaur models. The giant PNSO Ceratosaurus dinosaur model. The eagerly awaited PNSO Ophthalmosaurus has also arrived and it features in the newsletter too. A number of academics, palaeontologists and other scientists have made enquiries about PNSO replicas. The Ophthalmosaurus replica for example, will be used in science communications work. As well as sending out the newsletter to our subscribers, team members were busy ensuring that all those customers who had requested one of these models was contacted. The stunning PNSO Ophthalmosaurus model (Brook). PNSO have created a 1:35 scale model of Mamenchisaurus, an iconic Sauropod from China that had the longest neck relative to its body of any known member of the Sauropoda. Mamenchisaurus had nineteen cervical vertebrae and the neck of this twenty-one metre monster measured a whopping fourteen metres or so. It features in the Everything Dinosaur newsletter alongside a returning favourite, the PNSO Megalodon shark model is back in stock. 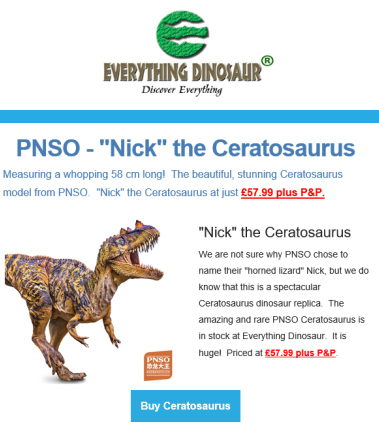 The PNSO 1:35 scale Mamenchisaurus model and the Megalodon model feature in the latest Everything Dinosaur newsletter. It can’t really be an Everything Dinosaur newsletter without one mention of Tyrannosaurus rex. The 1/35 th scale T. rex called “Wilson” is back in stock along with its counterpart, the magnificent Triceratops “Doyle” which has been modelled in the same scale. Also just arrived at Everything Dinosaur, are the latest editions to the PNSO small prehistoric animal model range. The set includes twenty-four, beautifully sculpted little prehistoric animal figures in the PNSO Toys that Accompany your Growth series. In the image, that we created for our spring newsletter, only fourteen of the twenty-four models were depicted, but this is enough to give model collectors a good idea of the breadth and the quality of this exciting replica series. PNSO “Doyle” and “Wilson” 1:35 scale models and some of the amazing PNSO small prehistoric animal models. Everything Dinosaur newsletter subscribers are amongst the first to learn about new models and replicas coming into stock. Subscribers can also be the first to join a VIP reserve list to ensure that they can acquire items. Our newsletter is sent out periodically and it is absolutely free to join. Scientists have identified tooth marks preserved in the tail bone of a duck-billed dinosaur as having been made by a sub-adult Tyrannosaurus rex. The researchers conclude that late-stage juvenile and subadult Tyrannosaurs were already feeding on the same types of large-bodied prey as adult animals, despite lacking the bone crushing jaws typical of a fully-grown, mature T. rex. Writing in the academic journal PeerJ, the researchers Joseph E. Peterson and Karsen N. Daus (University of Wisconsin), suggest that this study helps scientists to better understand the diets of Tyrannosaurs and the ecological role they played as predators in Late Cretaceous ecosystems. Biostratigraphically, the victim’s fossils relate to sediments were Edmontosaurus fossils are found, so the prey has been tentatively identified as an Edmontosaurus. The punctured tail bone indicating feeding by a sub-adult T. rex. The picture above shows views of the punctured tail bone (BMR P2007.4.1.) in (A) anterior view, (B) posterior view and (C) ventral view. Images (D and E) are close-up views of the punctures identified on the bottom portion of the caudal vertebra. Palaeontologists have identified numerous examples of Theropod dinosaur feeding traces and tooth marks. Such evidence provides information on predator/prey interactions, feeding behaviours and direct evidence of cannibalism in the Dinosauria. However, in order to determine the meat-eating dinosaur that fed, causing the marks, it is important that the biostratigraphy is known and the approximate likely growth stage of the animal feeding. The researchers state that currently, most recorded Theropod feeding traces and bite marks are attributed to fully-grown, adult animals, but in this study, the bite marks were compared to various jaws of different aged T. rex specimens and it was concluded that the best fit for the feeding traces came from the maxilla of a late-stage juvenile T. rex estimated to be around 11-12 years old. 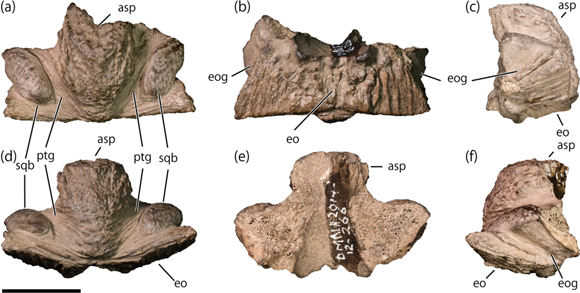 The dimensions and spacings on the caudal vertebra best matched the maxillary teeth of specimen number BMR P2002.4.1, a late-stage juvenile T. rex. Identifying the bite marks on the tail bone of a Hadrosaur. The dimensions and spacings on the tail bone best matched the maxillary teeth (upper jaw) of BMR P2002.4.1, a late-stage juvenile Tyrannosaurus rex. While bite marks resulting from active predation cannot easily be distinguished from post-mortem feeding traces, the position of the punctures in the Hadrosaur tail bone suggest that the duck-billed dinosaur was already lying on its side and therefore it can be concluded that the traces come from post-mortem consumption. The researchers propose that further identification of Tyrannosaur feeding traces coupled with experimental studies of the biomechanics of Tyrannosaur bite forces from younger ontogenetic stages may reveal dynamic dietary trends and ecological roles of Tyrannosaurus rex throughout the animal’s life cycle. Furthermore, this evidence suggests that late-stage juvenile Tyrannosaurs, at least in part, had a similar diet to the adult animals. The scientific paper: “Feeding Traces Attributable to Juvenile Tyrannosaurus rex Offer Insight into Ontogenetic Dietary Trends” by Joseph E. Peterson and Karsen N. Daus published in the journal PeerJ. A scientific paper on what is regarded by many scientists as the world’s biggest Tyrannosaurus rex has been published. It is time for the “T. rex” specimen nicknamed “Scotty” to step into the spotlight. It measures around thirteen metres in length and represents an individual more than thirty years of age, remarkably old for a Tyrannosaur. Based on the diameter of the leg bones and other measurements, the body weight of this formidable carnivore has been estimated at 8.8 Tonnes. It has been suggested that this specimen (RSM P2523.8), is a little longer and heavier than “Sue” (BHI2033), which resides in the Evolving Planet exhibit at the Field Museum in Chicago. On August 16th, 1991, Robert Gebhardt, a high school teacher by profession but also a keen fossil hunter, was working with Tim Tokaryk (palaeontologist at the Eastend Fossil Research Station). They were exploring the strata exposed along the Frenchman River Valley in Saskatchewan Province, for Robert this was an opportunity to learn more about field work. However, within a few hours, Robert had found the base of a heavily worn Tyrannosaur tooth, along with a caudal vertebra, the sort of discoveries that seasoned palaeontologists dream about. Robert had discovered the oldest individual T. rex specimen. It was not until June 1994, that the excavation work began on this new T. rex specimen in earnest. The dig site became a visitor attraction in its own right with several thousand people coming to see how the huge bones representing about sixty-five percent of the skeleton were being excavated. Unfortunately, the sandstone matrix surrounding the fossil bones and teeth was extremely hard, extracting the fossils from their 66-million-year-old rock tomb has proved to be one of the most challenging large Theropod fossil preparations so far undertaken. Scientists are aware that there seem to be two main types of Tyrannosaurus rex adult body plan – a robust form and a gracile form. It is not known what these two different body types represent, one could be male, the other female, however, “Scotty”, so named after a celebratory drink of scotch after the initial fossil discovery, is a very robust Tyrannosaurus rex. A silhouette outline showing the anatomical position of the known skeletal material of “Scotty”. There is considerable size variability among Tyrannosaurus. Some individuals were lankier than others and some were more robust. Scotty exemplifies the robust. He comes out a bit heftier than other T. rex specimens. Multiple measurements (including those of the skull, hip, and limbs) show that this was a robust individual with an estimated body mass exceeding all other known T. rex specimens and representatives of all other gigantic terrestrial theropods. A histological analysis of the fibula (lower leg bone), indicates that Scotty was a mature, adult animal that was over thirty years of age when it died. Dinosaurs exhibit indeterminate growth, as opposed to most other extant Tetrapods that have determinate growth. Simply put, this means that a dinosaur grows rapidly when young (T. rex growth spurts in the teenage years for example), but when fully mature, the animal keeps growing albeit at a much reduced pace. Therefore, a very old individual such as RSM P2523.8, could be larger than other Tyrannosaurs, such as T. rex “Sue”, which is believed to have been around twenty-years of age when it died. Although the fossil material is not as complete as the Field Museum T. rex, just like Sue, the fossilised bones of Scotty show plenty of pathology (evidence of injury or disease). This dinosaur may have had a long life, but it was a tough life too. A number of caudal vertebrae are damaged, it has been suggested that this pathology was caused by a bite from another T. rex. As with many Theropod specimens ribs show evidence of having been broken and subsequently healed and the jaw shows signs of an infection. Scott Persons stares into the jaws of “Scotty”. Intriguingly, the skull exhibits a number of lumps and bumps which suggests that T. rex could have had armoured skin, a feature not seen in other T. rex cranial material. A cast of the fossils will help to form a new mounted Tyrannosaurus rex display, part of an exhibit that is due to open at the Royal Saskatchewan Museum in May 2019. The big, robust bones of this Tyrannosaurus rex probably represent the largest of this species so far described. To most scientists and academics, which dinosaur was the biggest does not really matter, after all, the mass estimates for Tyrannosaurs vary considerably. However, the authors of the scientific paper, which include Phil Currie and Gregory Erickson, propose that RSM P2523.8 adds weight to the prior hypothesis that there is a sampling bias throughout the Dinosauria. “Scotty” with its mature, thick-set bones indicates that many other dinosaur taxa grew to significantly greater sizes than currently recognised. For the time being, the Royal Saskatchewan Museum can claim that they are putting on display a cast of the heaviest T. rex known to science, a claim that they can make, at least for now. It is likely that larger individuals will be discovered. The scientific paper: “An Older and Exceptionally Large Adult Specimen of Tyrannosaurus rex” by W. Scott Persons IV, Philip J. Currie, Gregory M. Erickson published in the journal The Anatomical Record.